The judgement to relocate polluting factories in Delhi leaves several questions unanswered. Will the powers-who-be work to turn good intentions into right actions? onD ecember 7, 2000, the Supreme Court set a one month deadline for closure of all polluting industrial units in residential and non-conforming areas of Delhi. The Union ministry for urban development with the help of other bodies and the Delhi government was given the responsibility of implementing the order. The court order is undoubtedly well-intended, but the behaviour of our political class leaves the common citizen with ample doubts on whether Delhi's environment will actually see the much-needed improvement in the near future. Lack of data on the polluting units coupled with the lack of political will may in fact dilute the verdict. Besides, rampant corruption threatens to make matters worse. S K Bawa, proprietor of Paramhans Electroplating in Vishwas Nagar locality of east Delhi, is one among the thousands caught in this labyrinth. While showing his effluent treatment plant ( etp ) to Down To Earth, he confidently said, "I have a no-objection certificate from the Delhi Pollution Control Authority ( dpcc ). I do not pollute anymore. I have been allotted a plot in Bawana. I have done all that the authorities asked me to. Why will they seal my unit?" A while later, he stood non-plussed in front of his sealed factory. The area sub-divisional magistrate, armed with the court and Municipal Corporation of Delhi ( mcd) order in his hands, had sealed his unit in a matter of minutes. He is just one of the victims of the knee-jerk reactions of the 'authorised bodies' to the sc order. It was dj vu for Bawa, who's unit had been sealed by the sc once before in January 2000. "I spent nearly Rs one lakh to install an etp, get it certified, pay guarantees to dpcc and get it de-sealed ," he complained . " If they had plans to seal my unit why did they ask me to spend so much money on the factory?" Exasperated Bawa rightfully blamed the politicians, the government and the powers that be for duping him. He acknowledges he does not understand the finer nuances of the case. But how many people do in any case? Many such stories rented Delhi's air after the verdict. Of the likes of Bawa crying fowl. Of government bodies at loggerheads with each other. Of those who kicked and those who got kicked. Of laws made by the policymakers and least understood by those responsible for its implementation. Of K K Venugopal, counsel for chief secretary of the Delhi government P S Bhatnagar, saying that sc never told Bhatnagar how the latter had not done what was required of him by law. And that of a panic-stricken S P Aggarwal, ommissioner of mcd, ordering the sealing of all units -- polluting or not -- and revoking all the ad hoc licences. Narendra Nath, minister for industries in the Delhi government, meanwhile, blamed Aggarwal for the chaos. "It is his fault. He did not tell us of his intentions to shut down all the units at the meeting which was attended by all the agencies involved and Bhatnagar," he said. It was such callousness that cost three lives, hundreds of injuries and brought the city to a grinding halt for days after the industries were closed on November 17 -- an outcry on which the sc commented: "The hooligans have held the city to ransom." Yamuna case "Polluting units should be sealed. But is this the way to go about it?" questions Vinesh Batla, manufacturer of high tension cables in Shalimar village. According to him, the dpcc first sealed units polluting the Yamuna river. This was done in accordance with the judgement on the ' mailey (dirty) Yamuna case' where the sc had taken note of the growing pollution in Delhi and in various orders from 1995 to 1999 ordered closure of all factories directly or indirectly polluting the Yamuna. Following the protests, dpcc reread the order of the apex court. They then asked the owners of sealed factories to install etp s if they wanted to start operations again. Many factory owners installed etp s and got them verified and tested. Once that was done, dpcc asked them pay a guarantee of Rs 10,000 each. Most of them complied, having already invested nearly Rs one lakh. But then the dpcc had another brainstorming session, after which some units were allowed to operate while others were sealed "in accordance with sc orders", says Batla. Floundering, as always It is nothing new for the politicians and the bureaucrats to doublespeak and give hollow promises in the name of the Delhi Master Plan, which some experts see as ineffective and flawed. The master plan is a statutory document made as per the Delhi Development Act, 1957. The second master plan was released in 1990. It promised relocation of non-conforming light and service industrial units with more than 20 workers within three years of allocation of land. As no land was allocated, dda relocated no one . Promises made in the second master plan remained part of a wish list. The case in question was filed way back in 1985. It asked for the industries in non-conforming and residential areas to be relocated according to the master plan. In November 1995, the court directed the Delhi government and mcd not to renew licences of erring industries. And in April 1996, the sc ordered the relocation of industries from residential areas. Successive governments and authorities failed to act, prompting the sc to first set new deadlines and then strip the state government and mcd of its role. It handed over the task to the Union ministry for urban development, making it the nodal agency for the implementation of the master plan. But the Union government threw the ball back at the state government's court, claiming it lacked administrative powers to carry out the relocation plan. Irked by the lax attitude of all concerned, the sc sent a notice to the chief secretary and the commissioner of mcd to show cause why they should not be 'prosecuted for wilful disobedience of the court's order'. Lack of information In 1996, the sc asked dpcc for information on the number of polluting and non-polluting units running in non-conforming areas. Teachers and students did a survey of Delhi for the dpcc. The survey put the figure of industries at 126,218 units with 97,411 non-conforming units. Only 52,000 of these applied for relocation, out of which 24,000 units' licenses were renewed. This survey is the only one done till date on polluting and non-polluting industries in residential areas of Delhi. Nath laughs off the findings and calls them unreliable. Batla calls it a "farce". In fact, during the ongoing contempt proceedings, the court pulled up Bhatnagar and Aggarwal for not possessing the latest figures. The harried government filed the numbers mentioned in the Delhi economic census of 1998. When the sc asked the government to reconfirm, as usual more time was sought. In the meanwhile, Down To Earth found the police conducting surveys in parts of Delhi. Nath says, "The surveys are being conducted at Jagmohan's behest." But the court order, too, goes easy on the authorities on one aspect. It says the authorities must enumerate the number of non-conforming industries, the nature of their activity and 'if possible', which ones pollute. It leaves a loophole open for mcd to escape from putting a figure on the number of polluting units. t he lack of a survey has also led to a paradox. Factory owners allege that those who tried to adhere to the regulations and apply for relocation are the ones facing the brunt. They claim thousands of other industrial units running illegally continue to flourish under the corrupt regime. "We went by the rules and see where it has landed us," laments Pramod Jain, a factory owner from Shalimar village. Workers of a sealed nickel-plating factory in Trinagar said that while their registered factory was sealed, there is another plastic recycling factory right behind their unit running illegally. Even today it functions by providing daily 'perks' to the officials, he alleges. The other side of the story is that the industrial units, operating out of these residential areas, have flourished and profited. Aided by corrupt officials and conniving politicians, many residential areas have turned into illegal industrial belts. The Delhi government wants to appease this section of the community by categorising these areas as industrial. dda: to the Union government; mcd: answerable to it's standing committee, where the Bharatiya Janata Party ( bjp ) councillors are currently in majority; delhi vidyut board (dvb): answers to the state government; delhi state industrial development corporation ( dsidc) : answerable to the state government; dpcc : answerable to state government. Says Vijay Risbud, commissioner (planning), dda , "It is the responsibility of dsidc to develop the relocation site. We have done our bit." J P Singh, managing director of dsidc rebuts, "The genesis of the plan lies in the delay on dda 's part." While Nath says, "All the work that the dsidc is doing is actually supposed to be done by the dda ." He gives his final verdict, "This is the only time we will let dsidc get involved in such an imbroglio. dda has to bear its responsibilities henceforth." Madan Lal Khurana and Sahib Singh Verma, both bjp members of Parliament, blame the current Congress government, while ministers in Sheila Dikshit's cabinet blame the previous Sahib Singh Verma government. The impression that current state government tries to put forth is that they have inherited a hot seat. "The sc order for relocation was passed when the bjp was in power. But they did nothing about it," says Nath. However, disturbing reports in the media say that one reason why no work got done was that several officials involved directly with the industries and the relocation process kept on being shuffled around. Bhatnagar, the current chief secretary, for instance, succeeded Omesh Saigal, who had earnestly taken up the task of closing the polluting units. Then it was divisional commissioner S P Aggarwal's turn. He is currently the commissioner of mcd . The state environment secretary, Rajiv Talwar, and the member secretary of dpcc, R K Goel, suffered a similar fate. When the chief secretary of Delhi was asked to show cause by the courts, panicked bureaucrats passed orders that caused the city to come to a grinding halt. Politicians belonging to both the Congress (I) and the bjp took positions in public to save their vote banks. Down To Earth has access to a secret report of the special branch of Delhi police that names Ravinder Bansal, a bjp mla, and Radhey Shyam Khanna, a Congress mla, beside other political leaders, for leading the protests. The report names the people responsible for leading the agitation in different areas. 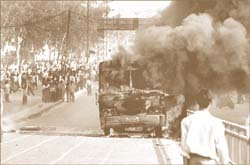 While the Union government used the report to home in on protesters on November 27, 2000, and prevent them from gathering in large numbers, the state government used this secret report to strengthen its case before the sc ; claiming implementation of the court's order was creating an 'alarming situation'. The same secret report blames Bansal-supported organisations for protesting on behalf of the villagers of Bawana. The Congress leaders, on the other hand, helped the position of the state government by creating chaos in the city, allowing Venugopal to say, "The task is enormous." Bawana befuddle The story of Bawana is another farce. Factory owners call it a hoax. "They have made allotments on papers. There is nothing there. Do they expect us to move to a barren land and start working there?" says Vishwa Mitra Bahal, president of Laghu Udyog Sangh (Small Industries Association), based in Delhi. Dharamdutt Sharma, a junior engineer at the site office, says work will be completed soon. But Nath says, "It can take up to two to three years." Jain, asks in an exasperated tone, "How am I to identify where my plot is when officers of dsidc office say they cannot do so?" Satish Kumar Gupta, a cable manufacturer based in Vishwasnagar, New Delhi, says, "The villagers do not let us enter. Some charge Rs 100 from us just to point a finger to what we are made to believe is our land." The residents of Bawana are agitated because some claim Sahib Singh Verma promised them the sky but never delivered. He is also accused in some media reports of purchasing land in Bawana before the acquisition to earn surreptitious profits. The government bungling does not stop here. The application form for relocation mentions that the applicant will have to shut down their units by March 2001, even if they have not been handed possession of the land. But they demand the increasing costs of development -- the price of their laxness be paid by the factory owners being relocated. The larger questions O P Verma, former civil superintendent in the Tis Hazari court and a resident of village Bawana, says, "The government is dumping all the dirt of the city here. How are they going to make sure that this place does not get as polluted as the filthy industrial areas of Delhi?" Anil Agarwal, director of Centre for Science and Environment, a Delhi-based non-governmental organisation, says, "Once these areas become dense residential pockets, will the factories be relocated again?" His concerns are not unfounded. Way back in the 1960s, the government shifted a industrial units to Mayapuri, which at that point was a godforsaken area on Delhi's outskirts. Now it is considered as prime land and very much a part of Delhi. Residents of Bawana fear that they may have to face a similar fate. Experts say it is all business and has nothing to do with environment as the site is in a greenbelt. Moreover, nothing has been planned for the workers, says a worried finance and revenue minister in the Delhi government, Mohinder Singh Saathi. "The Gandhian concept of organic growth has been forgotten. We want to define things our own way," says K T Ravindran, head, department of urban design, School of Planning and Architechture, Delhi. J ustice Kirpal, hearing the contempt case, is reported to have observed that most workers are migrants if they can work and live here, they can do so in Bawana as well. "While environment becomes a convenient term, lax and corrupt bureaucrats and vested interests play God," says B D Singh, a land developer based in South Delhi.